4 August 2015, at 7:00a.m. CHINA - China is the pork powerhouse of the world with over 51 per cent of the world’s population of pigs raised within China, writes Ron Lane, Business Director Asia Pacific. Looking at the size of the breakdown of the inventory for May 2015 and June 2015, the adjusted information from MOA is indicating 386.35 million on-farm pigs, a 39.26 million-sow herd for May 2015, 384.80 million on-farm pigs, and a 39.02 million-sow herd for June 2015. April 2015, there was 387.12 million on farm inventory and a 39.74 million-sow herd. The June 2015, 384.80 million on farm inventory is down 0.04 per cent from last month (May 2015). This is a further drop of almost 20.95 million on-farm pigs in the first 6 months of 2015. The total drop in on-farm pigs as compared to June 2014 is 10.0 per cent. Looking at the May 2015 sow herd, it was down 1.2 per cent from April and was down 15.5 per cent from one year ago. Looking at the June 2015 sow herd, it was down 0.6 per cent from May and was down 14.8 per cent from one year ago. Again in May, almost 477,000 sows disappeared and in June, a further 236,000 sows disappeared. During the first 6 months of 2015, 3.9 million sows have been culled and/or eliminated from the total national herd. This is more than what is owned by the top 25 pork powerhouses in the USA-and just think what would happen, if they eliminated all of their sows in 6 months. Since February 2013 (the past 28 months), the China sow herd has seen more than 12.16 million sows eliminated-more than 2 times the current USA sow herd. The current sow inventory is the lowest level in more than 4 years. Several farm households are deep in financial difficulty and bankruptcies of large farms are happening. Some large-scale farms are being shut down or being bought up by larger scale systems and this consolidation will continue to happen. Recently, in discussion with one large Chinese feed company, they will buy “distressed” farms with a minimum of 2,000 plus sows per farm and grow their sow business to about 60,000 sows over the next 12 months. Because of excessive elimination of sows along with a lower supply of market hogs, the market place is beginning to see a marked rise in pork prices since mid-March. During the next few months, market pig producers should see 2015 prices continue to rebound. Already in some specialty markets, one of Genesus’ clients has been receiving the market pig price of 18.6 RMB/kg ($ 3.06 USD/kg-$ 1.39 USD/lb). Because of the huge drop in sow and pig numbers in China over the past few years, the global pork industry is turning its sights on China. China has approved over 20 countries that can export pork to China and several of them are looking at the “opening of the big red door”. Currently, the spread between the recent US price of about $ 1.28 USD/kg-$ 0.58 per lb. 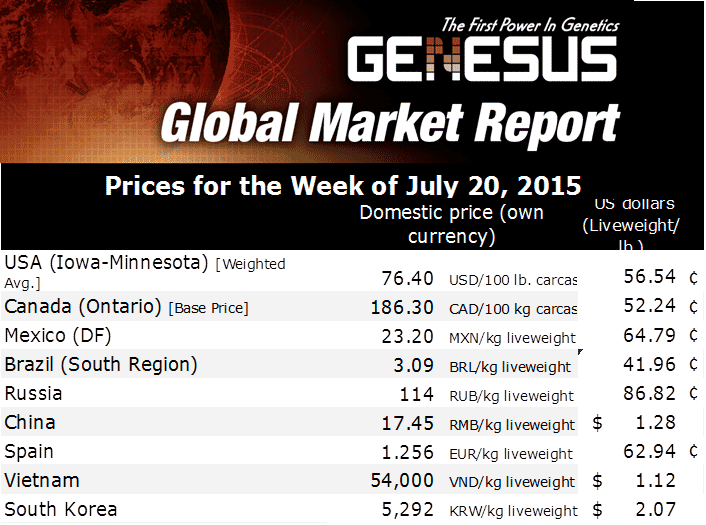 and China’s 17.05 RMB/kg or$ 2.80 USD/kg-$ 1.27 USD/lb) is over $170 USD per head on equivalent live-weight basis. This huge spread is an opportunity for all of the exporting countries, who have lost the Russian market, and who are struggling with local prices. Moreover, without a doubt, the owners of Smithfield Foods, WH Group-from China, will see the large upside for shipping US pork to the homeland. From the recent Rabobank quarterly report, the bank indicated that the pork supply is now quite tight in China as a direct affect from the lowered sow inventory. The rapid rise in piglet and market pig prices, shows a change in the supply and demand balance “which supports rising imports into Q4 and possible into 2016”. Average corn prices have been fairly stable for the past few weeks with corn at 2,420 RMB per tonne ($ 397.70 USD/tonne) for June 2nd and at 2,425 RMB per tonne ($ 398.52 USD/tonne) on June 30th, 2015. The national soybean meal price was 3,020 RMB/tonne ($ 496.30 USD/tonne) for June 2nd, 2015 and at 2,882 RMB/tonne ($ 473.62 USD/tonne) for June 30th, 2015. The Consumer Price Index (CPI) continues to be quite interesting for the national government. The CPI is made up of about 31.8 per cent food found in the consumers’ basket. Pork is estimated to be about 1/3 of the food portion of the basket or in other words, about 10 per cent of CPI as a whole. CPI was 1.4 per cent for June 2015 while May inflation rate was 1.2 per cent . June was worse than the market expected. The National Government “sensitive” food prices (including pork) weakened significantly after Spring Festival with a 4.5 per cent decline. Currently, pork prices are rising (by 7.0 per cent in June following a 5.3 per cent increase in the previous month). A sustained increase will cause the national government concern. As a measure, when pig prices increase, CPI should increase.